Cross Country Adventure is now available to play on Pogo! In this new Hidden Object Game (HOG) from Secretbuilders, you’ll be searching for hidden objects while scouting for the perfect filming locations with cinematographer Sarah! This is an episode-based HOG and it contains just 12 episodes. The first episode, Seattle, is free and the other episodes are 12 Gems each. If you’ve played the other Secretbuilders HOGs: Grub Crawl, Vanishing Trail, and Postcards from Britain, this game will be very familiar to you. Club Pogo Exclusive: Use Full Screen Mode to get a better view of the objects and surroundings. Scan the scene for multiple objects from your list, then find them in quick succession to get a Combo Bonus. You don’t have to find the objects in the order listed. 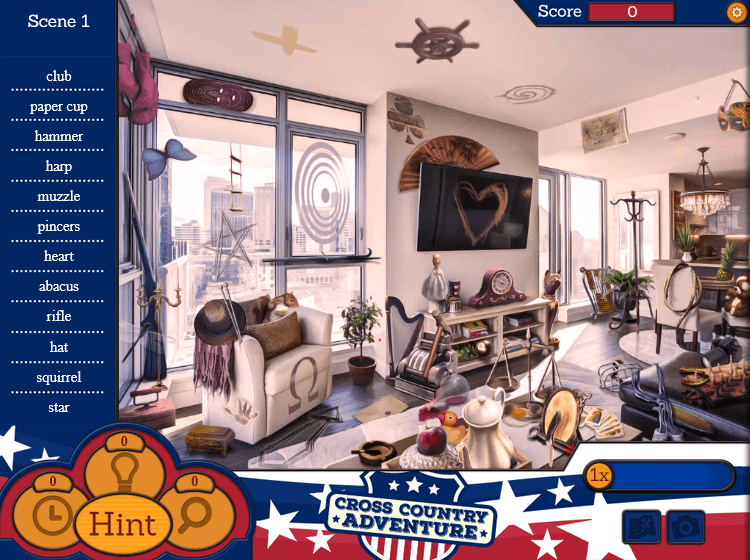 The faster you find all the objects, the more points you earn. It pays to be accurate. Avoid randomly clicking and aim for precision. Keep an eye out for special objects in each scene that will earn you even more bonus points. 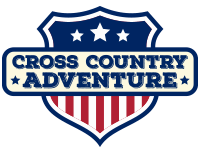 Go play Cross Country Adventure, then come back and share your reactions and your tips for each episode and overall gameplay in a comment below. Thanks! Played the first one (Seattle). Be aware that even though the “extra” points call for a Map and a Passport, it is actually a CAMERA instead of a passport. Weird! They must have fixed it already. The pop up that I got said either map or camera, and that’s also what is says now in the how to play section. P.S. DWTS jumped the shark, am I wrong? Pam – I sent poor Lura an email earlier about last night’s finale. Going to be honest and say I am fed up of HOGs now. This is nothing special, same as grub crawl, vanishing trail etc just with different scenes. Done the free episode and won’t be playing again except badges. Ditto Made for Loving Guy (grin)….that was a lot of typing!! I am no longer interested either and will not bother other than trying this one. I find my eyesight is just not good enough any more either. Anyone that finished the free episode and didn’t get a badge just wait about 5 minutes and it will show up. It’s happened on all 3 of my accounts, but they’re showing now. Scene 2 – They ask for a squirrel, but it looks more like a chipmunk to me, with the stripe on it’s tail. Scene 3 – They ask for a paraplanner a/k/a a parasailer. I just finished the last episode and there are too many mistakes to list them all. One episode asked for a parrot and it was a cockatoo. One episode asked for a windmill and it was a pinwheel. One episode asked for a Badger Hound and it was a Dachshund. clicked on the map and wow lmbo that was it. a long time now. 12 gems for a badge isn’t awful lol. First of all, THANKS “Lura” for providing a link to the game. My “homepage” currently does not have it listed under “Categories_HOGS”. I also entered the game in Pogo’s “Find A Game” slot and again it didn’t show up. However, I just saw it listed :under “Games A-Z”. Not a big fan. Some items are to small. Just not my type of hidden object game to play. i am not seeing new Country HOD game? Did you add it to your favorites. It is in the list where you edit your favorites. I was pleasantly surprised that this new one was easier on the eyes and the items were more clearly defined than in Grub Crawl or Vanishing Trails – either that or my brain just got used to these new HOGs…lol. Since you’ve finished all 12 episodes, I’d like your opinion of New Orleans and Boston. Did you like the scenes or do you have other favorite ones? Thanks. Just because, I managed to get through all 12 for both of us. There is a pattern of the items are look-a-likes with other HOG’S. Either my eyes were getting tired but I felt like the further we traveled the more difficult to find. At least there is a “free” one for challenges..
Pogo thanks for the free episode. Played and finished the free episode. Found it to be easy on the eyes and thought the items weren’t too difficult to find. Some of the background colors could have been smoother and lighter. Like the fact that the map and camera were out in the open and not hidden in a drawer. Not going to purchase any of the episodes and will just play for badges.